With a name like Slot Madness, it would be fair to think that the US-friendly online casino specializes in online slots. And they do. The site packs nearly 100 slot machines into their fast software, including multi-payline progressives, 3-reel classics, big slot machines with bonus rounds, and tons more. But Slot Madness, despite it’s someone biased name, is built for table games fans, too. In fact, the table games, video poker machines, and specialty games offered are so good that we think Slot Madness does a bit of a disservice to itself by focusing on slots in its name. There’s a lot to like about Slot Madness, no matter what time of game you play. And the same is true no matter what your bankroll is like. Slot Madness hands out free cash through several different deposit bonuses, and their VIP program rewards players with more cash and rewards when they least expect it—just for playing. We can’t pack everything we like about Slot Madness into just a few sentences, so keep reading for the full review. In keeping with the site’s commitment to do things on a crazy scale, Slot Madness offers more sign-up bonuses on any given day than most online casinos offer all year. Bonuses range from 100% match bonuses to 250% bonuses with no rules. Each bonus comes with different terms and conditions, and the online casino spells everything out in plain English so there aren’t any surprises. If you’re new to online casino games, you might find the bonus selection a little overwhelming. Sometimes, it’s nice to just have one bonus so you don’t have to pick. With that said, we do like the variety and the option to not be tied down to one bonus structure. We thought the Customer Service department would feel a little chaotic. After all, with a name like Slot Madness, you really don’t know what to expect. But we’re happy to report that the online casino’s Customer Service department is calm, cool, collected, and extremely knowledgeable. They’re available toll-free at 1-877-767-6920 and through 24/7 live chat. The links and numbers to the contact options are posted at the very top of every page of the Slot Madness online casino website, so help is never hard to find. 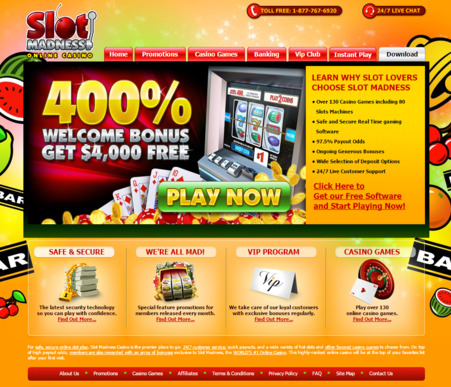 Slot Madness is a great, safe place to play slot machines and other games. They have a wide variety of games and Safe and Secure Real Time gaming Software. With 97.5% Payout Odds they have some of the most trustworthy payouts of any casino out there. They also have Ongoing Generous Bonuses and 24/7 Live Customer Support so you know you are in safe hands and can get a real person to help resolve any problem. In addition, Slot Madness also has a dependable VIP program where they take care of their loyal customers with exclusive bonus and features the latest security technology so you can play with confidence. Established and licensed in the country of Costa Rica. Whether you love slot machines or whether you’re into other online casino games, Slot Madness offers a crazy number of reasons to get excited about online casino games. But despite the fun and crazy name, they take important things seriously, including gameplay, security of all financial transactions, and personal privacy. With an as-close-as-you-can-get-to-flawless experience from first deposit to withdrawing your winnings, you can feel confident choosing Slot Madness. We definitely recommend this one.